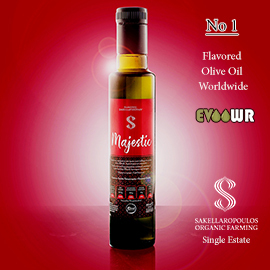 In one of the world’s largest, most important organic extra virgin olive oil competitions, judges from 14 countries awarded Greek olive oils 5 Extra Gold Medals, 10 Gold Medals, and 12 Silver Medals. After competing with 500 olive oils from 15 nations in this 23rd edition of the BIOL competition in Italy, Greek winners commented on their success. Greece’s top medalist in this international competition was Konstantinos Papadopoulos, with two Extra Golds for Mythocia Olympia PGI and Mythocia Omphacium organic extra virgin olive oils (EVOOs). It has already been a big year for Papadopoulos: these awards followed Extra Golds for the same EVOOs at the earlier Biolnovello competition, Gold and Silver awards at the Los Angeles International Olive Oil Competition (IOOC), and three awards at the Kotinos Competition in Athens, and they were followed by Best in Greece, Best Organic, and Double Gold awards at the Athena IOOC. 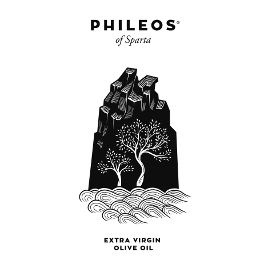 Another Greek BIOL Extra Gold was foreshadowed by a Biolnovello Extra Gold: Angelos Spyropoulos’s Centaurs Olive Groves EVOO won both—as it also did a year ago. This EVOO is unusual in combining homodynamic cultivation, an early harvest in October, and a blend of Koroneiki olives, wild olives, and extremely high phenolic Olympia olives for a very healthy result with noteworthy antioxidant and anti-inflammatory properties. Nikolas Philippidis of Hellenic Fields also encourages various plants to flourish in his olive groves. Already taking home six medals from international competitions this year, including a BIOL Extra Gold award for Ena Ena Organic Olympia PGI EVOO, Philippidis believes his company’s assessment of “the microclimate of the region and the ‘terroir’ characteristic of every grove” distinguishes them. Stella Galani was “very excited” when she learned about the Extra Gold her company’s Anoskeli Organic EVOO received this year, “and very proud of our work, because it’s very difficult” to convince Greek farmers that an early harvest and organic cultivation are worthwhile, when a January harvest produces more oil. “We try to educate the producers” about methods and benefits, arguing for the November harvest that produces their better, tastier award-winning EVOO, with its high phenolic content and balanced flavor. Focused on organic olive oil quality and ethical and environmental protection, the annual BIOL competition attracts hundreds of producers from all five continents. BIOL aims “to produce a complete reliable and updated overview” of the organic olive oil sector worldwide and to “promote knowledge and consumer interest” in high quality organic products, according to its website. Founded in 1996, the BIOL Prizes are organized by the C.I.Bi cooperative society in Apulia, sponsored by the Italian Ministry of Agriculture and Forestry, the Municipality of Bari, the International Federation of Organic Agriculture Movements (IFOAM), and AgriBioMediterraneo, and promoted by the Apulia Region, the Chamber of Commerce of Bari, and the Municipality of Andria, with additional collaborators. Aegean Gold, Rafteli Protouli M & Co. Thanks to Papadopoulos Olive Oil for the photos of their award-winning products. Toscolano Maderno, Italy, with initial tastings weekly through April 20, 2019, and final tastings at the end of April. Leone Selection EVOOs are announced immediately after weekly tastings, with final prizes awarded May 11. 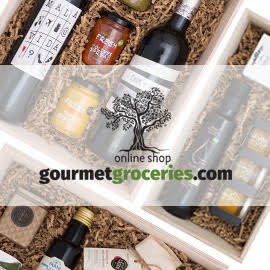 See the unusual rules for details: http://www.oliveitaly.it/wp-content/uploads/RULES2019.pdf. April 24-28, 2019, Portugal. Registration and samples due by March 22. Noteworthy: there is no entry fee for this competition. May 5-10, 2019, New York, USA. Early registration discount before January 1, later registration until March 1 or possibly later. A limited number of entries will be accepted. Samples due by May 3. Now called the NYIOOC | World Olive Oil Competition. See this article for more about changes this year. May 20-23, 2019, Calabria, Italy. Early bird registration before February 1. Awards ceremony June 1. A list of the very healthy, high phenolic winners of the Aristoleo Awards for extra virgin olive oil and table olives, with a chart showing different uses for olive oils according to their phenolic content. Greek producers like these New York International Olive Oil Competition winners have studied modern olive oil production methods and engaged in the persistent efforts necessary to make some of the world's best olive oils. Costas Vasilopoulos spoke with several Greek winners at the 2018 New York International Olive Oil Competition, where Greece won more awards and more gold awards than it ever had before. At the 4th Panhellenic Olive and Olive Oil Festival, which is organized by the Kalamata Agricultural Cooperative in cooperation with the regional and local government and other groups, important issues and food pairings were discussed, three people were honored for their contributions to the olive sector, and the Kalamata Olive Oil Awards were presented. Thanks to science, experimental new methods and minute attention to detail, olive oil producers on Crete are forging new paths with an age-old product. 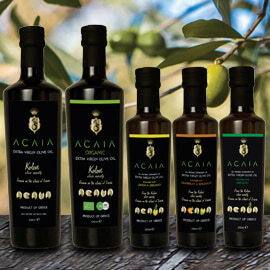 The winners of these awards produce especially healthy, high phenolic extra virgin olive oils. 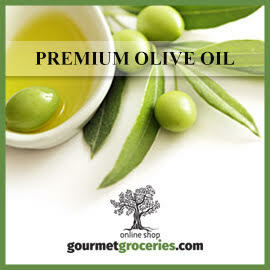 This is a good list to check out for particularly spicy olive oils full of health benefits. Awards ceremony at the 2nd Annual Aristoleo Conference “The Future of Olive Oil,” April 27-28, Nicosia, Cyprus. When the Oleocanthal International Society convened last month, healthy Greek extra virgin olive oils won several awards at the World Best Healthy EVOO Contest and the Health and Food Awards, and scientists discussed research related to olive oil polyphenols. First notes and photos from Cyprus about the recent conference focused on ultra-healthy high phenolic extra virgin olive oils, with awards presented to some of the healthiest olive oils in the world, including many from Greece and others made by Greek Cypriots. Producers, marketers, and exporters of this year's best Greek olive oils share what their New York International Olive Oil Competition awards mean to them, how they manage to produce olive oils good enough to earn top honors, and how this fits in with their company philosophies. "EVOOs were awarded by variety according 3 high phenolic types: Organic, Traditional, & Wild and based on the concentration of polyphenols in the 3 categories: TOTAL PHENOLS, OLEOCANTHAL & OLEACEIN, and OLEOCANTHAL." Many Greek EVOOs were winners. The third edition of the competition had more entries and a higher percentage of organic olive oils than in previous years. Twenty-one Greek extra virgin olive oils and two Greek flavored olive oils received Great Taste Awards in the United Kingdom this year. Seven Greek olive oil companies won 10 of the awards at one of the world’s most eminent extra virgin olive oil contests, the OLIVINUS competition in Argentina. Here is the list of results from this year’s TerraOlivo competition in Israel, where 629 samples from 19 countries were judged by 36 judges from 9 countries. That’s the second largest olive oil competition in the world, and the competition with the largest number of samples sent from abroad. The Oleocanthal International Society Conference and Olympia Health & Nutrition Awards featured breakthroughs in olive oil research, a new olive tree varietal, and an olive oil competition for high-phenolic oils. Here is the list of major winners (many of them Greek) on the conference website. You can also find the press release and some photos in the News section of that site. Here is a list of award-winning companies from the 2016 Los Angeles International Extra Virgin Olive Oil Competition. Notice, for example Village Batch’s Best of Class Gold Medal and the Gold Medals of PJ Kabos (2 of them) and Laconiko. Award-winning Greek producers discuss their reactions to the New York International Olive Oil Competition results and their efforts to produce the best olive oils in the world. Here is a list of award-winning Greek companies from the 2016 New York International Olive Oil Competition (where some non-Greek companies happen to show up). See the article above for more details about the top Greek winners. Toward the bottom of this page, you’ll find the lists of Silver, Gold, and Extra Gold medals for this competition in Puglia, Italy in March, with Greek companies on each list under the country “Grecia.” Note that Kyklopas, Olvia Green, and Mythocia won Extra Gold Medals. Here is the awards list from this Athens competition, with many Greek winners. 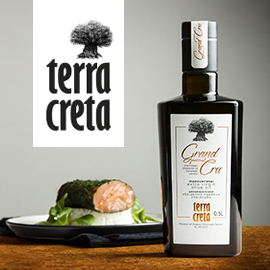 The 2nd Cretan Olive Oil Competition took place March 19 to 20 in Rethymno, Crete, awarding prizes for the best standardized conventional and organic Cretan extra virgin olive oils from the 2015-16 production season. If you click on the final word at the end of the paragraph on the linked page, it will take you to a list—unfortunately only in Greek—of the winners of the 2016 Kotinos competition in Athens. The first Cretan Olive Oil Competition (in 2015) sought to promote high-quality Cretan olive oil brands and the special characteristics of the best Cretan olive oils, to improve their position in the local and global markets, and to upgrade the overall quality of Cretan oils by developing the expertise of participants.